The 44th WIAA Girls' State Tournament was held at the Resch Center in Green Bay. Beaver Dam became the fifth team in WIAA state history to win three consecutive state titles. Marshall and Aquinas repeated as state champions. Bay Port and Black Hawk each won the state title for the first time in program history. Bay Port captured its first state title in program history (3rd state appearance), edging Middleton 50-49 on a basket by Emma Nagel with 2.4 seconds left. Bay Port entered the season ranked No. 4 in the WisSports.net Preseason Top 10. Beaver Dam won its third consecutive state title (5th state appearance), beating Monroe 65-46 in the championship game. The Golden Beavers became the fifth team in WIAA state history to win three consecutive state titles. Beaver Dam was the top-ranked team in the WisSports.net Preseason Top 10. Marshall won the Division 3 state title for the second straight season (4th state appearance), topping previously unbeaten Laconia 64-56 in the championship game. Marshall was the top-ranked team in the WisSports.net Preseason Top 10. Aquinas won its second consecutive state title (3rd state appearance), cruising to a 65-39 win over Melrose-Mindoro in the state championship game. Aquinas was ranked No. 1 in the WisSports.net Preseason Top 10. Black Hawk claimed its first state title in program history (5th state appearance), defeating previously unbeaten Clayton 51-36 in the championship game. Black Hawk was ranked No. 1 in the WisSports.net Preseason Top 10. Bailey Butler, soph., Black Hawk -- Butler played a key role in Black Hawk winning its first state title in program history. The 5-foot-7 point guard totaled 19 points, 2 assists, a steal and a block in the win over Clayton in the title game. Butler, who holds an offer from Green Bay, finished with 18 points, 5 assists, 3 steals and 2 blocks in the Warriors' win over Fall River in a state semifinal. Ellie Clements, sr., Whitefish Bay -- Clements tallied 18 points, 6 rebounds, 2 steals and 3 blocks in the Blue Dukes' 59-47 loss to Monroe in a Division 2 state semifinal. Shea Dechant, sr., Kimberly -- Dechant finished with 19 points, 8 rebounds, 5 assists and 2 steals in a state semifinal loss to Bay Port. The 5-foot-7 guard shot 7-for-10 from the floor, went 2-for-2 from the line, and made 3 of 5 three-pointers. Lexi Donarski, jr., Aquinas -- Donarski led the Blugolds to their second consecutive Division 4 state title. The 5-foot-10 point guard finished with a game-high 22 points, and added 4 assists, 3 steals and a block in a 65-39 win over Melrose-Mindoro in the title game. In a state semifinal win over Milwaukee Academy of Science, Donarski scored a game-high 28 points, to go along with 6 assists, a steal and a block. The Iowa State recruit shot 8-for-12 in the game, went 2 of 2 from behind the arc, and went a perfect 10-for-10 from the free throw line. Sydney Hilliard, sr., Monroe -- Hilliard, a Wisconsin recruit, led the Cheesemakers to a Division 2 state runner-up finish, in her third year guiding them to the state tournament. The 6-foot point guard finished with 23 points and 4 rebounds in the loss to Beaver Dam in the title game. In a state semifinal win over Whitefish Bay, Hilliard posted a game-high 25 points and added 6 rebounds. Nakiyah Hurst, frosh., Milwaukee Academy of Science -- Hurst finished with a team-high 20 points and 15 rebounds in the Novas' loss to state champion Aquinas in a state semifinal. The 5-foot-10 freshman shot 9-for-15 from the floor. Alison Leslie, sr., Clayton -- Leslie helped the Bears finish as the state runner-up in Division 5. The 5-foot-9 Ripon College recruit scored a team-high 18 points, and added 5 rebounds and 2 steals in the Bears' comeback win over Newman Catholic in a state semifinal. Leslie tallied 11 points, 4 rebounds and 2 assists in the loss to Black Hawk in the title game. Natalie Leuzinger, jr., Black Hawk -- Leuzinger helped lead the Warriors to their first state title in program history. The 5-foot-7 wing finished with 18 points, 6 rebounds and 3 steals in a 71-39 win over Fall River in a state semifinal. In Black Hawk's 51-36 win over previously unbeaten Clayton in the title game, Natalie tallied a game-high 23 points, and added 4 rebounds, 2 assists and 2 steals. Anna Lutz, soph., Marshall -- Lutz helped lead the Cardinals to their second straight Division 3 state title. The 6-foot-1 forward finished with 26 points, 7 rebounds, 3 blocks, 2 steals and an assist in a 64-56 win over previously unbeaten Laconia in the title game. In a state semifinal win over G-E-T, Lutz tallied 10 points, 5 rebounds, 6 steals and 2 blocks. Kiarra Otto, sr., Laconia -- Otto led the Spartans to a state runner-up finish in the program first trip to the state tournament. The 5-foot-9 guard finished with 28 points, 5 rebounds, 3 steals and 3 blocks in a win over Freedom in a state semifinal. In a loss to Marshall in the title game, Kiarra totaled 27 points, 6 rebounds, 3 steals and a block. Emma Nagel, jr., Bay Port -- Nagel led the Pirates to their first state title in program history. The 6-foot forward finished with 23 points, 16 rebounds, 3 assists, 3 steals and 2 blocks in a 63-53 win over Kimberly in a state semifinal. In the Division 1 state championship game, she scored the game-winning basket with 2.4 seconds left to lift Bay Port to a 50-49 win over Middleton. Nagel tallied 11 points, 13 rebounds and 2 assists in the title game. Julia Seidel, jr., Newman Catholic -- Seidel netted a game-high 22 points in the Cardinals' loss to Clayton in a state semifinal. She shot 7-for-10 from the floor, went 4 of 5 from the charity stripe, and made 4 of 5 three-point attempts. The 5-foot-7 guard also had a pair of steals in the contest. Sitori Tanin, jr., Middleton -- Tanin helped the Cardinals finish as the state runner-up in Division 1. The 6-foot-2 forward, who owns a handful of Division I offers, finished with 10 points, 10 rebounds, 2 assists and a steal in a 62-53 win over top-ranked Mukwonago in a state semifinal. In a loss to Bay Port in the title game, Tanin totaled 13 points, 10 rebounds, 3 assists, 5 blocks and a steal. Maty Wilke, soph., Beaver Dam -- Wilke helped lead the Golden Beavers to their third consecutive Division 3 state title. 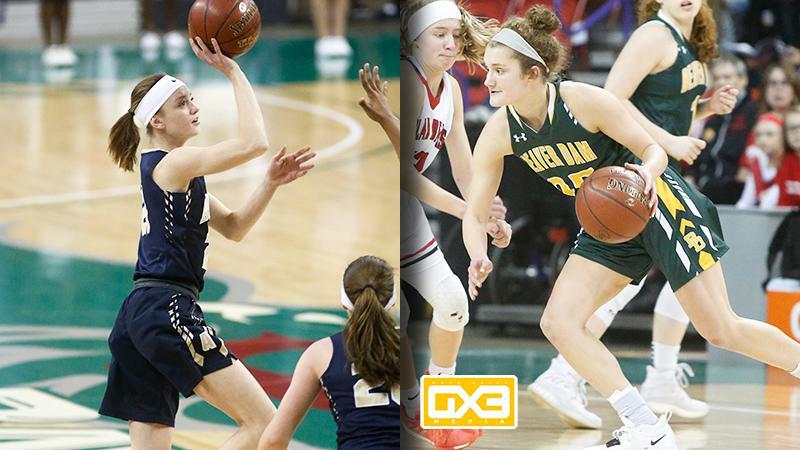 The 5-foot-10 guard, who owns numerous Division I offers, scored a game-high 20 points, and added 7 rebounds, 4 assists and 2 steals in a 68-48 win over Hortonville in a state semifinal. In Beaver Dam's win over Monroe in the title game, Wilke tallied 10 points, 2 assists and a steal. Visit my Instagram page for some video highlights and photos from the state tournament. For the latest and most up to date girls' basketball news and recruiting information, follow Norbert on Twitter @NorbertDurst. Email story ideas, recruiting info, etc. to Norbert by clicking here.